The history of white diamond «Kohinoor» ( «Mountain of Light»), which now adorns the crown of Queen Elizabeth, known since the XIV century, but found it was obviously earlier, according to legend, all in the same mines of Golconda. For several centuries it was decorated with a turban Raja of Malwa Dynasty State. There are legends that the first owner of the stone was a legendary hero of the Indian epic Mahabharata, Karna from. Therefore, there is a belief among the people that when the «Kohinoor» change the owner, then the state will be enslaved. That is what happened in 1304, when Malwa won the Delhi Sultan Ala-ud-Din, who arrogated to himself the famous jewel. Later, stone was replaced by many dynasties — Mughal dynasty Afsharid Dynasty Iranian, Afghan Durrani — everywhere it is considered a symbol of power, so the owners do not always bloodless. Historians say that the owners of the eighteen diamonds that some were assassinated, others were killed in battle, and the rest died in poverty. 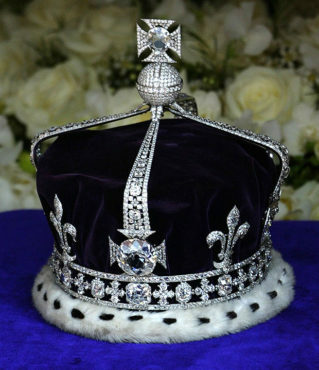 In the end, the Kohinoor was in 1849 in the hands of the British authorities and was transferred, among other property, to Queen Victoria.